MZ132A SPRAY TYPE HANK YARN DYEING MACHINE from China Manufacturer - Wuxi Weifeng Dyeing & Finishing Machinery Co.,Ltd. Best suited to dyeing of single strand fine yarn, artificial silk, silky yarn, pure silk, mercerized cotton yarn and mercerized wool, natural and synthetic fibers and blended fancy yarn etc. ● Best suited to dyeing of single strand fine yarn, artificial silk, silky yarn, pure silk, mercerized cotton yarn and mercerized wool, natural and synthetic fibers and blended fancy yarn etc. ● Adoption of specially designed high efficiency, low range of lift, big flow rate blending pump, which has gentle water jet and provides at high temperature adequate water quantity so that dyeing is strictly homogeneous free of spots and lamination. ● New type of hex spraying nozzle to give homogeneous water jet, so that yarn is fully free of elltanglement or knot, small friction between the yarn and the bobbin. ● Specially equipped with water quantity regulator of wide application range, with which to regulate water quantity as per needs. A low bathing ratio design, economizing greatly on dye, steam and agents in order to achieve max economic efficiency. ● Auto systems for temperature rising, holding and lowering. ● Fully automatic computer control systems. ● Frequency conversion mode of control for the main pump motor. ● Stirring device of material feeding barrel, material feeding pump. 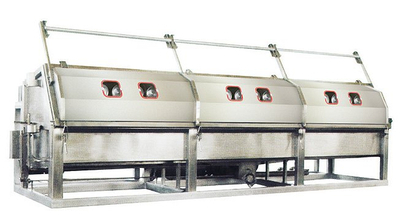 ● Machine body is made of fine quality stainless steel. ● Triangle spraying nozzle made of SUS316L highly erosion resistant stainless steel. ● Equipped with high performance stainless steel blending pump with mechanical seals. ● ·Equipped with material feeding barrels for heating, return flow and cleanillg facilities. ● Reliable PLC for control. ● Water level indicator, illumination lights. ● Tools to make easy yarn loading and unloading.